Whale Definition - What Does Whale Mean? 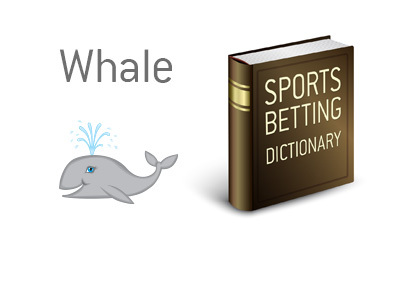 What does the term whale mean in the world of sports betting? What is meant by the term whale? In sports betting, a whale is a person who makes very large wagers. A whale is somebody who places wagers so large that the sports book who receives the bet will usually adjust the line. For instance, let's say that a whale walks in and wants to bet $1 million on the latest Floyd Mayweather fight. In this case, in order to minimize the potential damage to the book, the sports book will adjust the odds by making Mayweather an even bigger favorite than he already was. Las Vegas sportsbooks will go out of their ways to attract whales. This might include comped rooms, comped dinners and even use of a private jet in order to get to and leave Vegas. Whales, as you can probably guess, are big business for casinos. Rich whales who place large bets are big revenue earners for the casinos, which is why the red carpet is always rolled out for them.